2011 has not disappointed us. It has been just as nuts as we thought it would be. Two little kids, Matt’s job, and a new business has meant very little sleep in our home and moments when Matt and I barely recognize one another. We tell ourselves constantly, “It won’t always be like this”. But then there are times where I morn the same idea – It won’t always be like this. Carson will never be this little again, Autumn may not wonder at the world the same way she does today, and we may never again accomplish as much as we do right now. 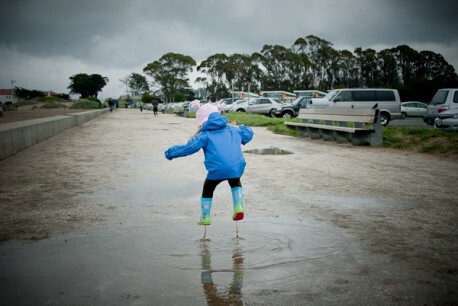 Today we seized the rainy day and sought out the biggest puddles we could find. Autumn knew just what to do. We celebrated being home with one another, even if it was only a few short hours before Matt had to head out for a Saturday’s worth of work. Crissy Field didn’t disappoint and it was such a pleasure seeing smiles on our little girl’s face after so many days of life with a two year old. If you have kids over two – you know what I mean. and well hold my little boy in the dark and enjoy snuggling away from the world. That my friends, is the silver lining. A pause in the dark to realize how precious the moment is – just before you fall asleep and miss it. More photos from the day can be found here on Jody’s Flickr site.